I know, almost everyone of us know that our skin is our largest organ. It covers our entire body and has a surface area of around 2 square meters. The thickness of our skin varies from 0.5mm on our eyelids to 4mm or more on the palms of our hands and the soles of our feet. In total, it accounts for around 16 percent of our body weight. That's why we have to take care of our largest organ. During my teenage years, I suffered from cystic acne. They were so huge, gross and very unsightly, I hated looking at myself in the mirror. Take a shower everyday to cleanse my face and body. Wash my face everyday with a mild soap and warm water. Get at least eight (8) hours of quality sleep. Soon, it was bye bye pimples and Acne. But because I am a growing teenager, it keeps on coming back. Paying for my dermatologist's advise put a huge hole in my pocket! Remember I was only teenager back then, and rely only on the allowance given by my wonderful parents. So I devise my own regiment in order to be Acne Free forever! Cleanse! This is the first step you need to take in order to clear most of your acne. There are no magic tricks in curing your acne. But you have to start working on it now, yes right now, not tomorrow not later. You need to pay attention about how you cleanse your face and body. Use natural soap and shampoo and bath regularly. Use toner and moisturizer. Good thing I discovered Proactiv. It is very effective for me. Detoxify! Clean your body from inside out. Start now. Eat fresh fruits and vegetables and plenty of water. Eating right can help you clear out your acne. It is really lifestyle, baby! So change your diet right now and be Acne free forever! Sleep! Get at least eight (8) hours of quality sleep. This helps your body to regenerate cells and repair itself. Exercise! I used to go to the gym. But due to health reason my best exercise now is walking! Yes! It is free, low-impact and can clear your mind. Just don't do it under the heat of the sun, ok? Let me share a little exercise secret :-) I go to the mall and walk around window shopping, that way, there's a free air-conditioner and when I get thirsty I can ask for water from the resto's or better yet I could buy a bottle from the mall's grocery store. I was window shopping the other day in a popular mall, when I saw this signage. I was so curious that I can't keep myself not to ask the beauty consultant in-charge of the promo. 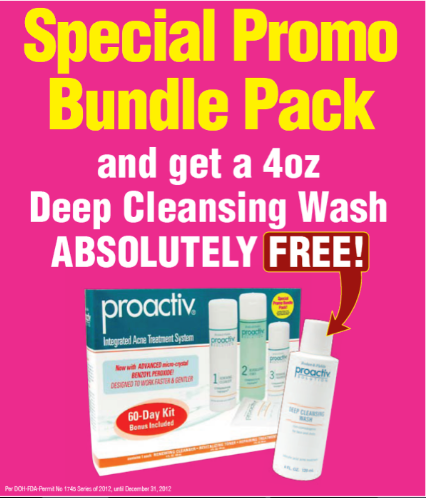 I learned, that when you purchase Proactiv, you will get a deep cleansing wash for free. Cool! This is really amazing! An early Christmas gift to everyone with acne. Yohoooo! The beauty consultant also shared with me the benefits of the Deep Cleaning Washing and how to use it. I learned from her that the Deep Cleansing Wash helps in exfoliating dead skin cells and pore-clogging oil and impurities while it cleans and refreshes your skin. Who should use it: Ideal for people with acne all over the body especially in shoulders, chest and back. Acne isn't restricted to our face. It can appear anywhere on our body. Proactiv can heal and prevent acne breakouts on our face, back, arms, legs, or anywhere else in between. Promo will run from October 15 until December 31, 2012 only. 1. The Free Proactiv Deep Cleansing Wash, P650 is not convertible to cash and or other Proactiv products. 2. The price of the Free Proactiv Deep Cleansing Wash, P650 will be deducted from the refund value, should the customer avail of Proactiv’s Standard Money Back Guarantee. Per DOH-FDA promo permit # 1745, series of 2012. Some would agree guys are not really serious into beautifying themselves and doing something like a deep cleansing habit or routine....But I guess the generation of today are different now. I see a lot of men becoming more concerned with the way they look. Gyms are packed with men, even Salons.....the barbershops only have kids and old men. Teens now go to their favorite salon and prefer expert hairdressers and beauticians....Wow! This promo is very timely! Thank you for the information. We'll go check this out this weekend so we can avail of the proactiv promo! Cool! I hope this can really remove my pimples. I'll buy tomorrow! Proactive has been very popular and well endorsed by celebrities. It's a bit expensive bit if it works it's definitely worth the money. With the promo, it's a bit of savings. The Metrosexual men are now aware of good skin care, proactive helps them achieve clearer and smoother skin. My dermatologist wanted me to use facial toner and cleansing wash. I think proactive is a good product I'll try this, thanks!